But neither is the future rosy for the animals, according to Douglas, who uses satellite tracking to monitor their movement and fill in “key information gaps” on how the bears use both the sea ice and land. 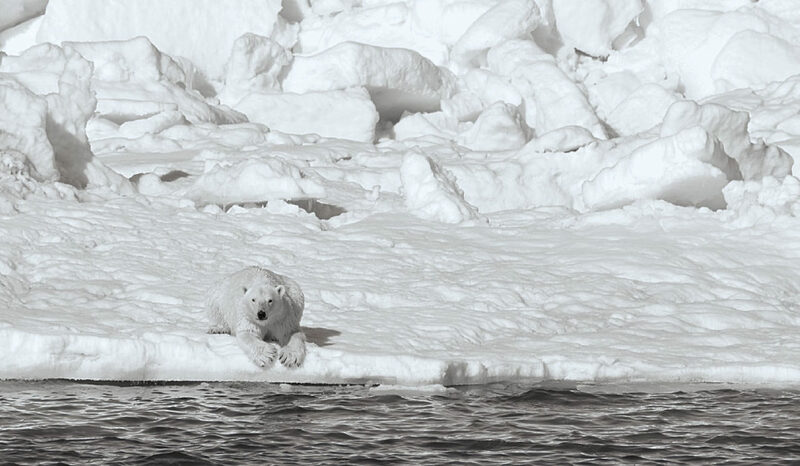 Some studies suggest that there are 20,000–25,000 polar bears living in the wild, but exact totals aren’t known. What is known is that their icy seal hunting habitat is under siege by rising temperatures. In March, sea ice measured 5.4 million square miles—larger than the United States by 1.6 million square miles; that compares with a historical average of 5.9 million square miles. While the USGS has no say in discussions about limiting greenhouse gas emissions —the prime reason for the Arctic thaw, according to most scientists—the work of Douglas and Rode attempts to influence dialogue. For her part, Rode spends up to six weeks annually in the Arctic hinterlands, namely the Chukchi Sea, where she measures and takes blood work from sedated bears. She also observes behavioral patterns. Sea ice losses have forced the bears to spend, on average, 30 more days on land while waiting for winter ice to form, at which point they can return to their hunting grounds. When they’re on land, the bears are known to eat berries or bird eggs. Douglas says the animals are “kind of fasty,” meaning they’ve adapted to go for three or four months without eating seals. “All bears are sort of intrinsically adapted to a feast-and-famine lifestyle,” he notes.